NOTE: You are paying the non-refundable deposit of $250 per Scout for Black Swamp Area Council's National Jamboree contingent. This fee is due to BSAC at time of application submission and can be paid here online or at either one of our service centers. By registering for the 2017 Black Swamp Area Council National Scout Jamboree contingent, you agree to meet the payment schedule outlined below. The cost is $1700 for each contingent member. This fee is dependent on what the local contingent Scouts determine to have as its touring plan, and supplies for members, like t-shirts, hat, patches, etc. What’s the council Jamboree Refund policy? : If you sign up to attend and then cannot, a Jamboree refund will be processed only if Black Swamp Area Council has a paid replacement contingent member for your spot. The $250 deposit is non-refundable. Why payment schedule is important? 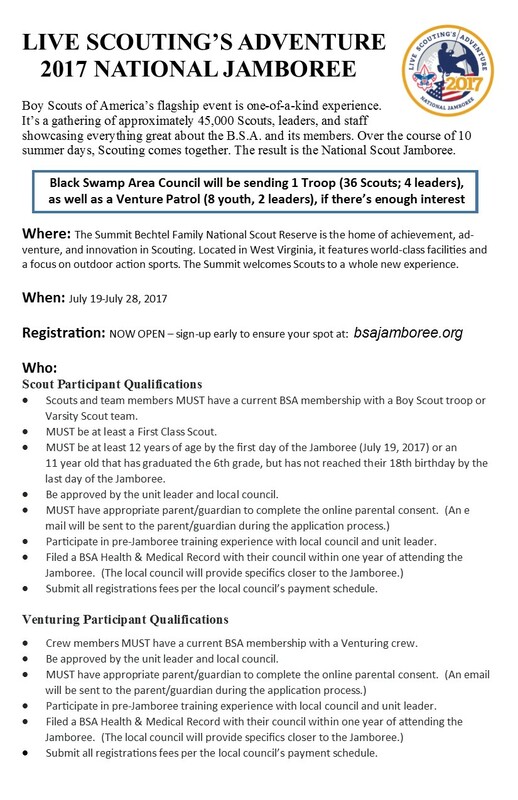 : Black Swamp Area Council is required to make 3 payments equaling $48,750 to National BSA for sending our contingent members (Troop & Crew) to the National Jamboree. These payments are due: January 2016 for $8,750; July 2016 for $20,000; and, January 2017 for $20,000. If the council is unable to meet these requirements, the contingent will be responsible for the late fee, which is $50 per person regardless of the individual’s payment made to our local council, for each of the three payment dates. What’s the “Final Payment” mean? : This payment will be depended on transportation cost, potential extra touring/sightseeing plans, and other items that may be purchased for the contingent members like t-shirts, hat, back packs, water bottles, uniform patches, etc. Will there be fundraising opportunities? : This is possible, depending on the need and volunteer help to organize and conduct a successful fundraiser, with council approval. What’s the non-refundable $250 deposit? : This covers items like program material, service costs incurred by council during the planning stages and event. It also is a good-faith payment to hold the participant’s contingent spot. What is the council Jamboree Refund policy? : If you sign up to attend and then cannot, a Jamboree refund will be processed only if Black Swamp Area Council has a paid replacement contingent member for your spot. The $250 deposit is non-refundable.